Choose from over 300 hotels at 27 UK airports. Book Airport Hotels or Airport Hotels with Parking. Compare hotel prices from not just one but Four of the UK's leading providers including Holiday Extras, Superbreak, APH and FHR. We do the searching so you save money and time. If you are driving to the airport then finding an airport hotel with parking package may save you money. Since when combined you will often find the price cheaper than parking alone. You will be able to start your holiday a day early staying the night before your flight and feel totally refreshed for your travel in the morning. Plus by staying near the airport it will mean short transfer times to the terminal, which is great for those early morning flights and a way to avoid the early morning motorway jams and rush hour traffic. You can stay at an airport hotel before your holiday or even on your return and still take advantage of the airport parking offers. 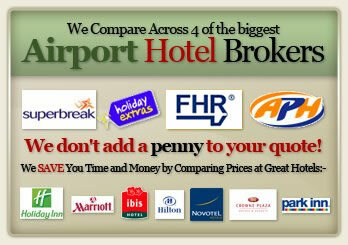 We compare all the hotels at your chosen airport and compare prices for accommodation whatever your budget. Choose from 2, 3, 4 & 5 star hotels and selected guest houses. and up to 15 days parking. 4 Stars - Very convenient for the M4 and M25 motorways. Ideally situated in Bath Road for all Heathrow terminals. The Holiday Inn hotel features three restaurants, a bar and a gym. and up to 15 days airport parking. 4 Stars - Just two minutes walk to Stansted main terminal. 500 luxury bedrooms, four restaurants and superb leisure facilities including a swimming pool. and up to 15 days parking. 4 Stars - Enjoy a stay at this 4 star hotel situated on the airport complex and just 5 minutes by free transfer to the terminals. The well appointed rooms at the Crowne Plaza are all air conditioned and the hotel features a restaurant, bar, lounge plus a sauna. and up to 15 days Parking at Gatwick. 4 Stars - Located next to Gatwick South terminal. You can just walk through in minutes. It is one of our most popular hotels and its facilities include 2 restaurants, 2 bars and a gym. All rooms have high-speed internet access.